We are told that on December 14, 2012, a lone gunman, Adam Lanza, went to the Sandy Hook Elementary School (SHES) in Newtown, Connecticut, where in the space of 11 minutes, shot and killed 20 first-graders and 6 adults. We are also told that after the massacre on January 2, 2013, SHES reopened in an empty school about 7 miles away in Monroe, CT — Chalk Hill Middle School at 375 Fan Hill Rd. — until a new swanky SHES was rebuilt with a gift of $50 million from the state of Connecticut. 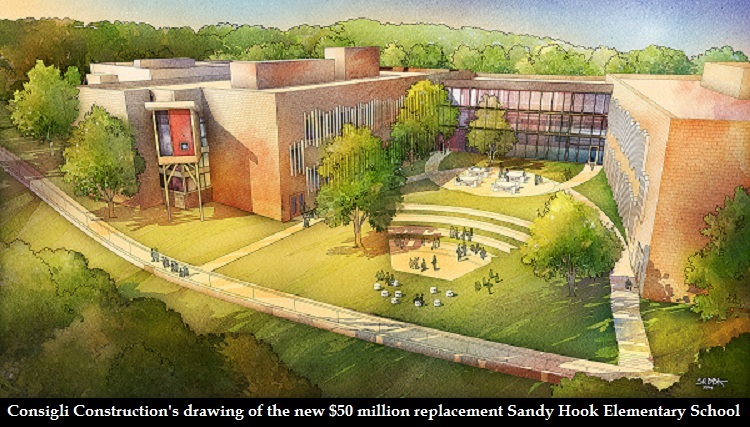 $50 million for an elementary school! It turns out that asbestos-contaminated SHES had been closed years before the alleged shooting massacre (see “Sandy Hook hoax: 6 signs that school was closed before massacre”), and Chalk Hill Middle School had been abandoned and empty since June 2011 (CTPost). Thanks to Wolfgang Halbig, a former a law enforcement officer (U.S. Customs inspector and Florida state trooper), educator (public school coach, teacher, assistant principal and principal), and nationally-recognized school safety consultant, we have documentary evidence that SHES had moved to Chalk Hill Middle School at least months before December 2012, including invoices for food deliveries to Chalk Hill but billed to SHES. Recently, Mr. Halbig uncovered yet another piece of evidence. 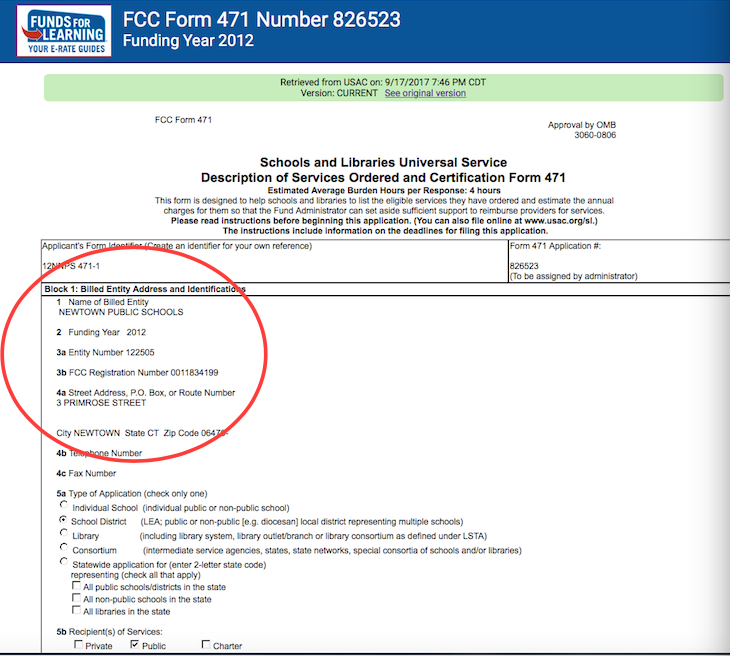 All U.S. public schools and libraries are required by the Federal Communications Commission (FCC) to use USAC Form 471 — a form designed to help schools and libraries to list the eligible services they have ordered and estimate the annual charges for them so that the Fund Administrator can set aside sufficient support to reimburse providers for services. Note: USAC is Universal Service Administrative Co., which has a Schools and Libraries (E-rate) Program that provides discounts to keep public school students and library patrons connected to broadband and voice services. 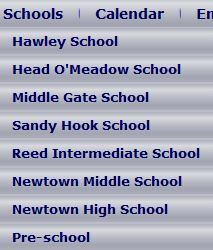 Chalk Hill Middle School is in Monroe, CT, and is not a school in the Newtown Public School District, so why is the school listed on Newtown Public Schools’ 2012 FCC Form 471 for the funding year 2012? Deadline: The FCC Form 470 must be certified in EPC at least 28 days before the close of the FCC Form 471 filing window for the funding year in which services are requested. EPC = E-rate Productivity Center, the account and application management portal for the Schools and Libraries (E-rate) Program. 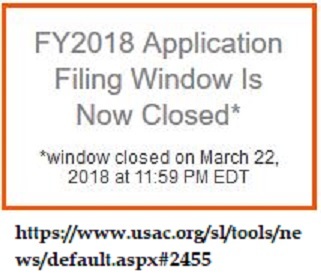 That means that for funding year 2012, the deadline for Newtown Public Schools to submit its FCC Form 471 was March 2012 — 8 months before the alleged shooting massacre at Sandy Hook Elementary School, and nearly 9 months before SHES was temporarily moved to Chalk Hill Middle School. 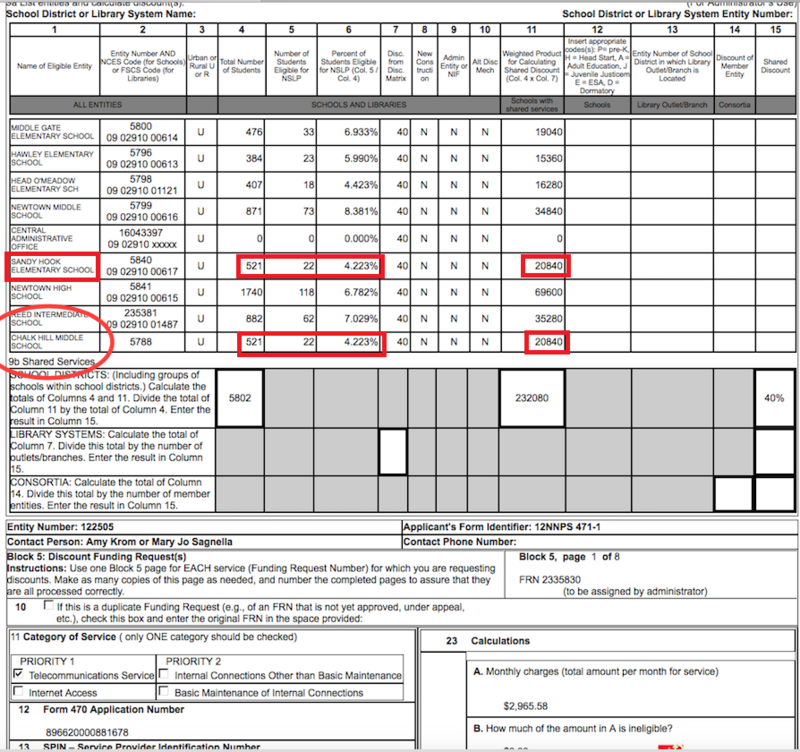 So why would Newtown Public Schools, in March 2012, include Chalk Hill Middle School — a school in Monroe, CT, which had been abandoned and empty since June 2011 — in its 2012 FCC Form 471? Unless, of course, Sandy Hook Elementary School had already relocated to Chalk Hill in Monroe by March 2012, if not earlier. Since SHES had moved to Chalk Hill Middle School in Monroe, CT, months, if not years, before the shooting massacre, who, then, were the students and teachers whom Lanza shot to death at SHES in Newtown, CT, on December 14, 2012?